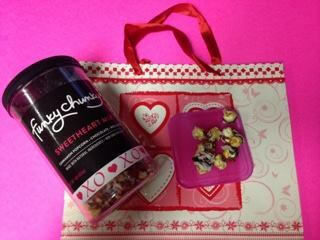 Funky Chunky is every sweets lovers dream! If you like chocolate they have it all white, dark and milk chocolate. Funky Chunky has caramel, cinnamon and seasonal flavors! They have seasonal flavors and gifts for every occasion! Check out the amazing birthday gifts and their holiday gift assortments. Bring everyone together at your next corporate function with Funky Chunky's corporate packages! I am such a fan of the seasonal varieties! I love pumpkin and think the Pumpkin Cream Cheese looks absolutely delicious! I was able to try almost every flavor including the Sweetheart Mix! 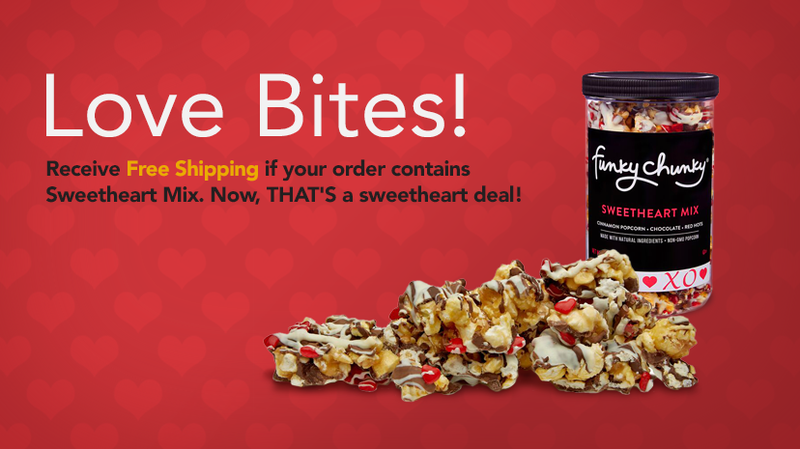 Right now if you add the Sweetheart Mix to any order shipping is free! 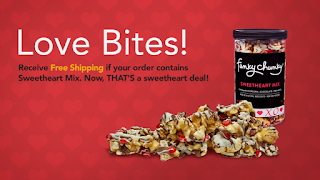 My family and I tried out the Sweetheart Mix, Sea Salt Caramel Popcorn, Peanut Butter Cup Popcorn, Chocolate Pretzels and the ChipZel Popcorn. I loved every flavor and so did my family. I am not even a fan of cinnamon and I loved the Sweetheart Mix! The ChipZel Popcorn was my favorite it actually includes potato chips, pretzel sticks and popcorn drizzled in caramel, dark, white and milk chocolate. When I say drizzled I mean really drizzled! Every variety has thick swirls of different chocolate and or caramels. You can find a flavor everyone in your family will love because they have so many different varieties! My husband loves peanut butter so I knew his favorite would probably be the Peanut Butter Cup Popcorn. He loved it! I even enjoyed it and I don't like peanut butter that much. The peanut butter mingles with the chocolate and popcorn so well. I also truly enjoyed the Sea Salt Caramel Popcorn. I love salty and sweet together so this mix was perfect for me. I have a pretty good feeling this will be one of my Valentine's Day gifts from my husband. He knows I love Funky Chunky! Peanut Butter cup Popcorn... Yum!!! The Funky Chunky love bites looks super good! !